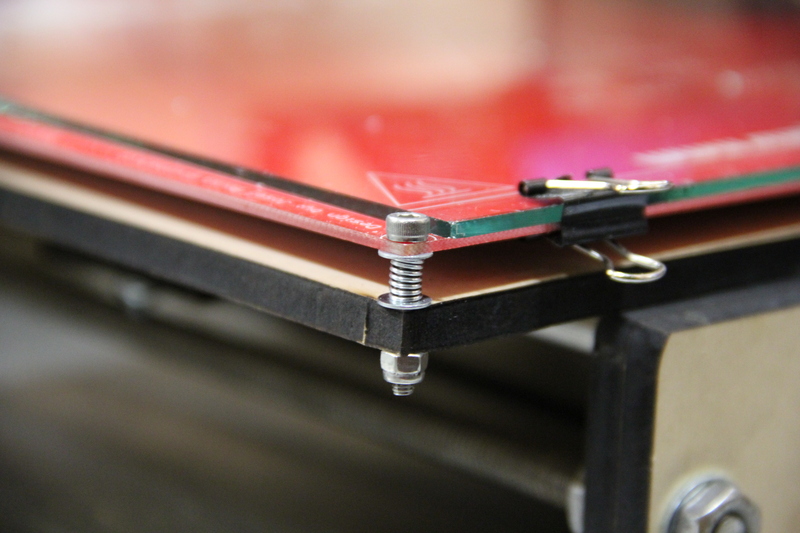 New manual bed-leveling mod for the Makerfarm Prusa i3. One thing that has always bugged me about the Prusa i3 design is the lack of a good way to level the bed along the Y-axis. 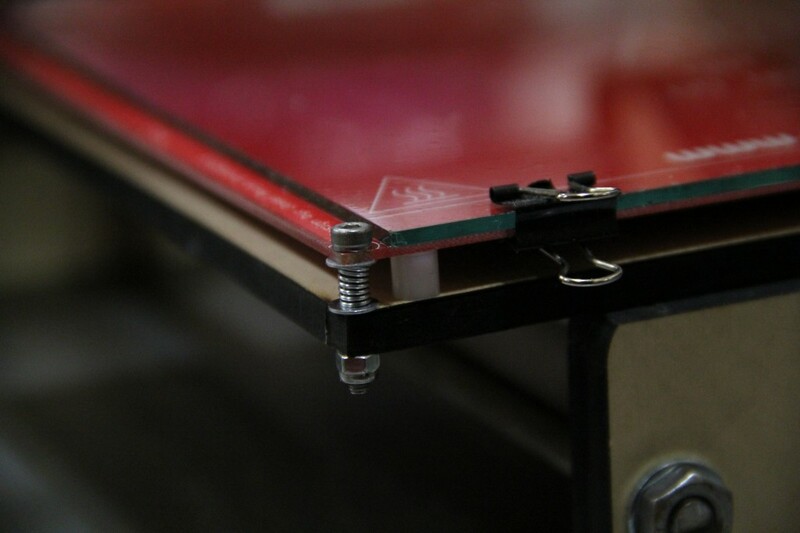 Leveling the X-axis is easy, if somewhat tiresome: Just home the Z-axis at the side of the bed nearest the endstop, adjust until your sheet of paper or your feeler gauge just slips under the hotend, then move the hotend to the opposite side of the bed. Home the Z-axis again, and twist the threaded rod until the feeler gauge again just fits. Repeat until both sides are equal, and you’re done. Assembly was a breeze, and the whole conversion took about five minutes, including looking around for parts. Here are the parts you need to make a single print bed standoff. I made three of these. If you wanted to leave one end of your Y-axis static, you could just make two. If you want to make each corner adjustable, you could make four. Basically, you’re going to just be replacing the nylon standoff that is already between the wood base and the heated bed with the spring and two washers. This is what your adjustable standoff should look like when it’s in place. I left the nylon insert in place at the corner where the X and Y axes both home. It gives a single, static reference point, and establishes a “standard” height, so I don’t end up raising or lowering the entire bed over the course of several adjustments. I now have a manually adjustable Prusa i3 bed! On the other hand, if you’re stopping by the hardware store already, this represents probably about $2-3.00 us. 7 comments to New manual bed-leveling mod for the Makerfarm Prusa i3. When you say local hardware store, where do you mean? I have yet to find a local supplier of anything smaller than M5, and even then the selection is small. I walked three blocks from my house to an Ace Hardware and got springs and bolts. I got the locknuts in quantity from a locally-owned store called Wichita Feed and Hardware, which is a little more of a walk (maybe a mile). 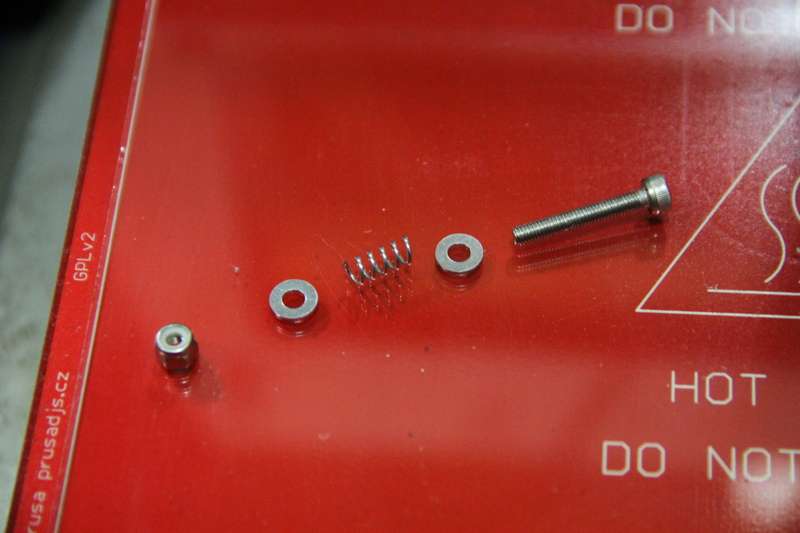 For really strange things, like the really long bolts for extruders, I go to a local fastener supply place (Mt. Hood Fastener). That one is about 3-4 miles, so I usually drive it. Of course, this is meaningless unless you live in Portland, OR, USA. Most of the smaller metric stuff is available through the RC car industry, so I’d start with hobby shops. It’s going to be expensive there, so you might want to ask if they know of a local bulk supplier. If all else fails, Amazon.com. Oh, and stay away from the big box places. I have yet to see anything small and metric in anything except those plastic bagged two-packs, and they are absolutely outrageously expensive! I have been buying metric hardware from http://www.mrmetric.com mrmetric site. They start out at 2mm and go beyond 12mm. I ordered all my hardware for a printer build in stainless steel. Their selection are many. You want a washer in 3mm well they have four or more types in each size to choose from. My order arrived overnight but I live on the west coast where they are located. I’m a little late to the party but I found what I needed at Home Depot. The most expensive part was the box of assorted springs.